Reversal explores spatial and conventional expectations, process, product, and a photograph’s relationship to time, collapsing many of these subjects into themselves. The installation portrays a mock photo shoot, as if in a photographer’s studio, in which two sculptures, comprised of hinged, upright, serigraphy screens with backing boards, are placed on black, seamless backdrops in mirror reflection of each other. 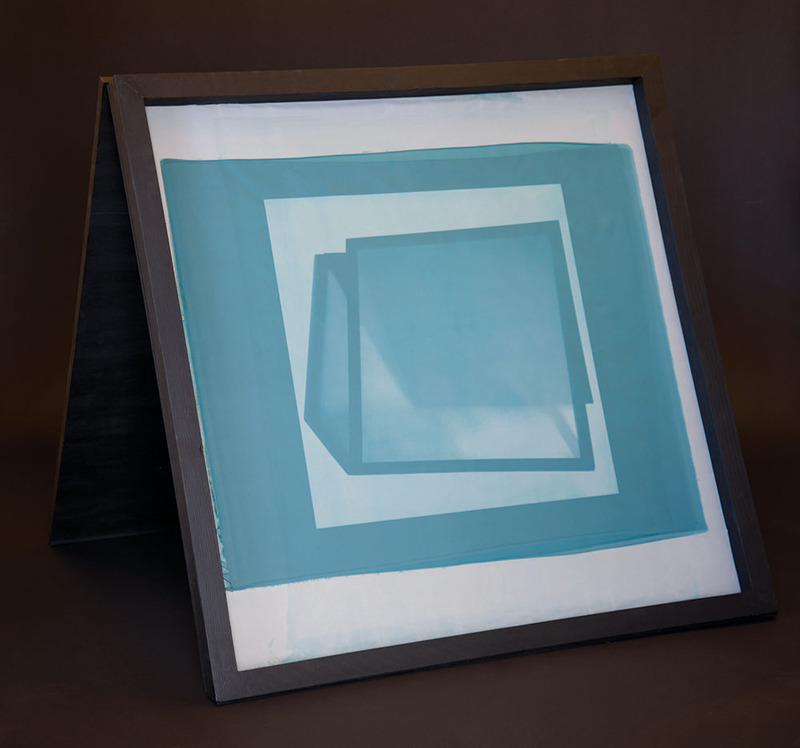 Instead of conventional framed photographic presentation, the positive photographic images are seen in exposed light sensitive emulsion layers on the faux serigraphy screens. The resultant emulsion border evokes memories of a sloppy photographic border, a vestige of analogue photography, seen now most often applied by modifications made in apps and photography manipulation programs. In this case, however, a digital image was used and the analogue serigraphic process added the evocative border. As the serigraphic printing frame and screen become replacements for traditional frame and mat, their function shifts from that of process to final product. This shift in purpose is also viewable in the image embedded in the emulsion, which is seen in positive (reversal) form, whereas in serigraphy, a negative of the image would normally be visible on the screen allowing, when printed, the ink to create a positive on another surface or object. The shadows of the sculptures on the seamless become as integral a part of the piece as the images on the screens. 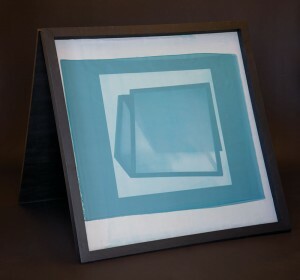 The transparent substrate of the screen allows the photographic images’ shadows to fall onto the backdrop paper below. In contrast to a photograph, which claims to freeze moments in time, here, as the shadow shifts with the moving daylight, the photograph is creating fractional shifts in moments instead of capturing them. The black edges of the serigraphic frame blend into the backdrop, causing the seamless to become a disruptive object in the installation that no longer serves as a voiceless, neutral base generally intended to highlight a sculpture as end product, separate from its surroundings. The work wrestles with the control over the artist that process normally has and reverses that dynamic by curtailing and thus turning these processes into a product. Reversal demonstrates ambiguities of the photographic medium, its application, and its processes, while simultaneously displaying it as an end result.